Lexington psychiatrist helps workers and athletes recover from concussion. LEXINGTON What would you do if a family member developed a medical condition that was outside your expertise but not so far that you couldn’t help? When Lexington, Kentucky, psychiatrist, Steven W. Croley, MD, learned that his son had experienced a concussion while playing youth soccer, Croley himself was propelled into the diagnosis, treatment, and rehabilitation of concussion symptoms. Though not a neurologist, Croley soon learned that the treatment protocol of concussion and head injuries was lacking vital objective evaluation tools, one of which is objective balance testing. Croley says that standard evaluation relies heavily on a subjective clinical observation, such as the Romberg test for balance. Such testing, says Croley, is too subjective and interpretive by the clinician administering the test. “We can’t see the damage done to the neurological circuitry through imaging. And previously all we have is the physical manifestations of the symptoms of brain damage due to injury such as loss of consciousness, headaches, blurred vision, and sleep disorders. Along with neurocognitive testing, now we have technology that enables us to objectively evaluate and track the patient’s balance ability. It’s is a critical step forward,” he states. The technology Croley employs as the medical director of his Sports Concussion Center is a software program called Equilibrate by Balance Engineering, which measures the stability of the patient’s upper and lower body functions. Croley had experience in evaluating his patient’s executive function in his psychiatric practice. Many mood and mental health disorders show a pattern similar to, or caused by head injuries. Difficulties with judgment, time management, insight, attention to detail, and impulse control were behaviors that Croley’s psychiatric patients have in common with head injuries. He sometimes sees the same pattern with elderly patients, car accident victims, and war veterans who are misdiagnosed with post-traumatic stress disorder, when it is really head injury driven (mTBI). Balance testing is an important diagnostic tool even though the circuitry involved such as eyesight, inner ear, and cerebellum function, which controls proprioception, cannot be imaged. How to measure a patient’s balancing functions has been a quest that Croley pursued. 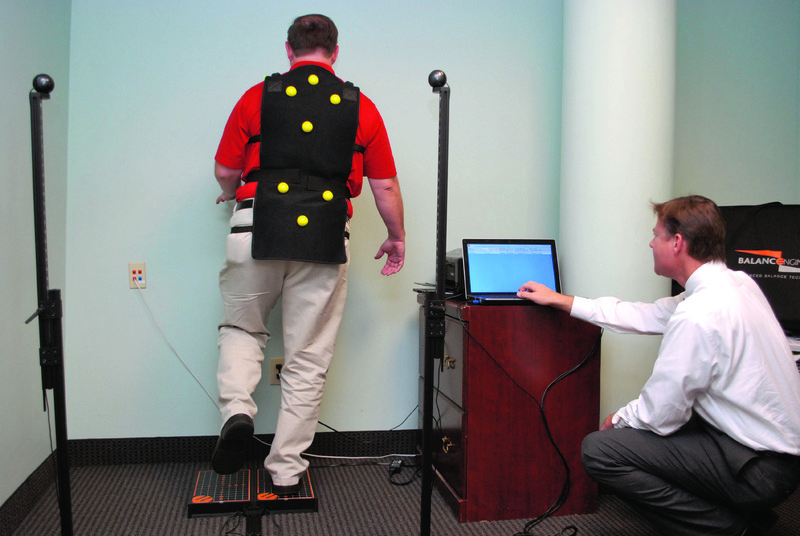 The Equilibrate system works by having the patient stand on a measuring platform wearing a vest with reflective plates. 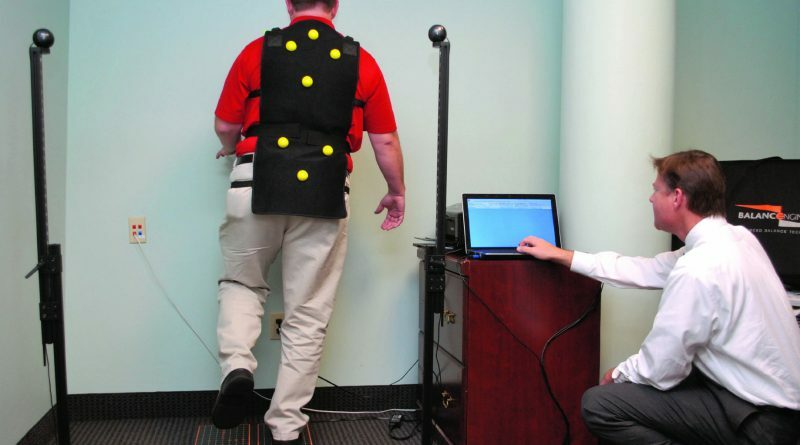 Cameras record and sensors in the platform measure the patient’s movements while he performs certain tasks such as standing on one foot, leaning, shifting weight from one foot to another, and standing with eyes closed. The data on the patient’s movements is received by the cameras and are transferred to a computer with software that will analyze and compare the patient’s movements with either his personal history or national standards for healthy patients of similar height, weight, and age. “Ideally, if we had a baseline test, pre-injury, we could systematically and objectively chart the patient’s recovery by monitoring his balance ability and track how far we have to rehabilitate the athlete before he or she can return to play,” says Croley. The new national consciousness of the effects of head injury to athletes is the new normal, says Nita Smith, marketing and education director for the Sports Concussion Center. Her focus is to reach Kentucky athletic directors, trainers, and coaches and make them aware of new technologies available for the evaluation of concussions. Kentucky now has legislation that requires a medical examination and doctor’s permission before a student athlete with a head injury can return to play. “Our role is to provide a tool for medical professionals to monitor and watch athletes recover from head injuries,” says Smith. Rehabilitation by physical therapy is part of the process and a service offered by the Sport Concussion Center. Scott Cook, PT, with Performance Physical Therapy in Nicholasville, Kentucky, works with many of Croley’s patient athletes to develop core muscle strength and joint positioning sense. “After a head injury, core strength is needed to compensate for any malfunctioning of the athlete’s internal balance control system,” says Cook. The Equilibrate balance testing system gives Cook valuable information to assess the progress of physical therapy and the athlete’s rehabilitation. Second Impact Syndrome (SIS) and Chronic Traumatic Encephalopathy (CTE) are serious medical conditions that can result from repeated brain injuries from contact sports. Balance testing is now employed by the NFL, the NHL, college programs, and the Department of Defense for concussion evaluation. In March 2012, the Kentucky legislature passed HB 281, sponsored by Representative Joni L. Jenkins (D -Jefferson) and co-sponsored by 34 fellow representatives of both parties. Passage in both House and Senate was unanimous. The new legislation added language to previous legislation that directed the Kentucky Board of Education to require that interscholastic coaches complete an approved training course on common sports injuries such as heat and cold illnesses, emergency recognition, and head, neck, and facial injuries. In the new legislation, the “Not Return to Play” provision was added as well as a requirement that interscholastic coaches “seek proper medical treatment for a person suspected of having a concussion” (KRS 160.445, 2a). The March 2012 legislation further stated that “a student athlete suspected by an interscholastic coach, school athletic personnel, or contest official of sustaining a concussion during an athletic practice or competition shall be removed from play at that time and shall not return to play prior to the ending of the practice or competition until the athlete is evaluated to determine if a concussion has occurred. The evaluation shall be completed by a physician or a licensed healthcare provider whose scope of practice and training includes the evaluation and management of concussions and other brain injuries. A student athlete shall not return to play on the date of a suspected concussion absent the required evaluation (KRS 160.445, 3a). Legislators additionally stipulated that the concussed student athlete is not permitted to return to practice or play until a “written clearance from a physician is provided” (KRS 160.445 3c).